Sean Connery in a wedding dress. Sean Connery in a wedding dress? Okay, I may have been a little overly dramatic about that last one. You’ll also remember Sean Connery in a red leather thong. Well, I’m making it seem like a bad movie (spoiler: it is a bad movie! ), but that’s only because it is a bad movie (the spoiler is safe to read now). To be fair, not everything about it is terrible. The idea that in a society of immortals, boredom would be a major threat is, if not precisely novel, at least reasonable. The role Zed is to play in things is a pretty nice twist. Actually, all of the ideas and plot of the movie are at least serviceable, and in another movie could be pretty good. It’s the execution that ruins it. The movie suffers from poor acting, underdeveloped plot lines, and, in my opinion, a rather disjointed feel. It’s all very odd. 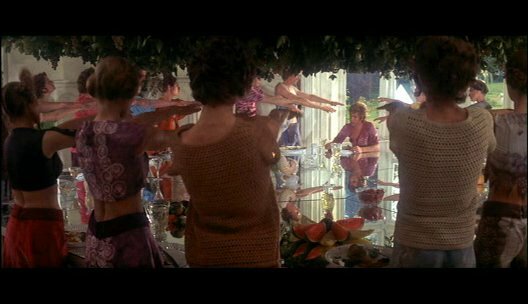 The part that holds the most promise (again, in my opinion) is the examination of the ‘utopian’ society, but it’s just not shown in enough depth to make this a particularly thought-provoking movie. We’re shown little pieces of it, and we’re told a bit more, but ultimately the film doesn’t investigate the really interesting questions–it’s like Boorman (who both directed the film and wrote the screenplay) had a bunch of ideas for scifi films, and decided to stuff them together, with shallow treatments all around. Why are they all waving their arms? They have magic psychic powers. Don't expect much examination of this. Besides the sometimes-inscrutable plot lines, the film is full of cheesy scenes, like the aforementioned one containing Sean Connery in a wedding dress. Some of them are certainly intended to serve the plot, but fail–the scene where everyone is voting on Zed’s fate is clearly meant to show that over the years they’ve come to be able to communicate without words, but it just comes across as a bunch of people wiggling and grimacing. It’s weird. 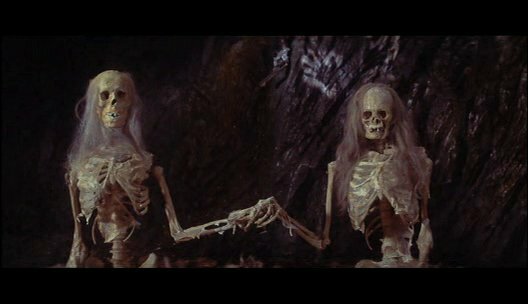 The movie ends with two skeletons holding hands. Spectacular. Zardoz is probably worth seeing once, if only to see how bizarre it is. If it doesn’t scar you for life, you may just get something out of it, too. 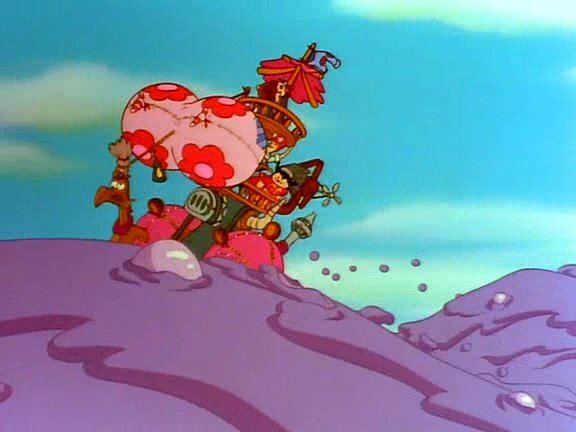 My Little Pony: The Movie tells how the witch Hydia creates a monstrous purple ooze called the Smooze, and uses it to attack Dream Valley, where the little ponies live. If this is what's going on in Dream Valley, you can understand Hydia's point of view. I watched this movie because I had been so pleasantly surprised by the quality of the recent series My Little Pony: Friendship is Magic. If, I thought, the new series was so good, surely the older entries in the franchise couldn’t be too bad, either. Well, I’ll say it now: this movie did not live up to my (fairly low) expectations. Sailing on a sea of Smooze. I guess they've earned it. My Little Pony: The Movie opens with a fairly Disney-esque scene with some animals playing around in the receding snow, followed by the preparations for the spring festival. Then we are shown that Hydia is not at all pleased by all the cheeriness. The next part of the film is taken up by Hydia and her two incompetent daughters attenmpting to create the Smooze to cover up Dream Valley. 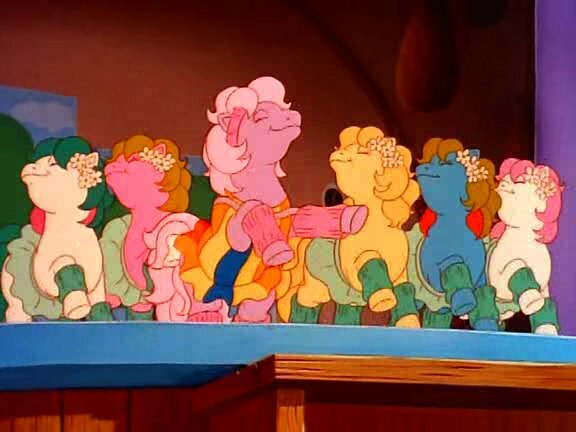 Once they succeed, various ponies (and a few humans) go through some troubles seeking help, and they ultimately succeed in driving off the Smooze. Hooray. The Grundles are kind of ugly-cute, I guess. They're some of the good guys in this story. Well, the plot’s far from complicated, but that’s okay for a children’s movie. The animation is mostly reasonably competent, too. But there are quite a few things that just don’t work. There are times when the animation indicates a character should be saying something with a lot of emotion and force, but the voice actors didn’t seem to get the message. 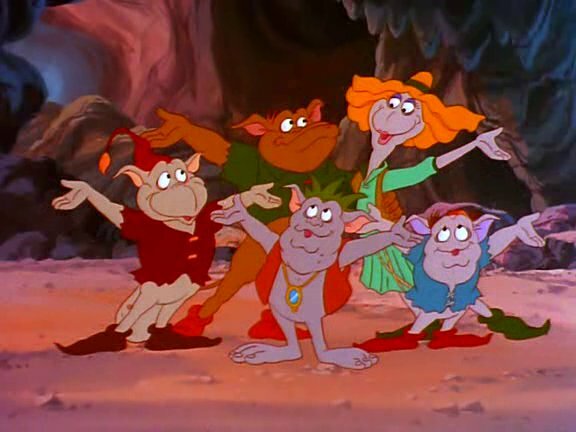 But that’s not the worst part: the worst sin is that the voices of the characters are mostly the sort of weird inhuman voices that were so common in cartoons a couple of decades ago. I think we’ve mostly gotten away from that lately, but this film is from 1986, so we’re stuck with it. The songs aren’t great, but they’re acceptable. They don’t inspire me to purchase a soundtrack or anything. Hydia’s song at the beginning, encouraging her daughters to be evil witches like the rest of the family is actually kind of fun. Speaking of Hydia: what’s up with her? She has really no concern for her daughters’ safety–they’re nearly killed several times in this movie, and no one makes any mention of it. It’s weird. In the interest of comparing unlike films: this is kind of like Edward Scissorhands in that it shows that people (or, in this case, ponies) are horrible. 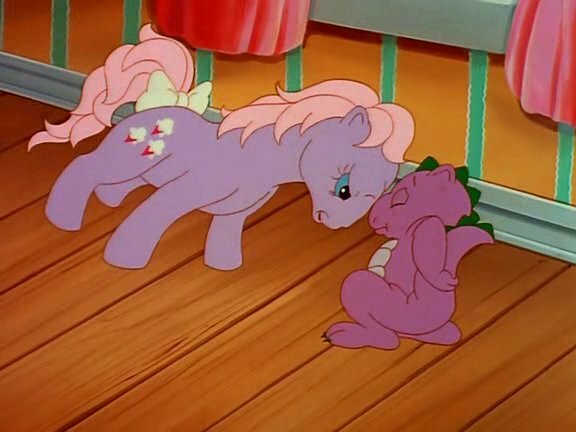 Poor Lickety Split is rather ill-used by the others, and when Spike offers to go with her so she needn’t go it alone, she hits him hard enough to send him flying into a wall. People are awful and cruel, whether they have four legs or two. Okay, comparing it to Edward Scissorhands was a bit of a stretch, but I’ve got to keep myself amused somehow. That is one angry pony, singing one angry song. But she's got her reasons. Well, the film is basically a mediocre children’s movie. It’s not exactly the worst movie I’ve ever seen or anything, but it’s not a movie I’d care to watch again. Maybe kids will find it more engaging. I’d caution you not to buy it merely on the strength of the more recent TV series, though. Edward Scissorhands is basically a good, but not great, film. The story in brief, is this: Peg sells cosmetics for Avon, though she isn’t very successful at encouraging her neighbours to buy them. After quite a run of bad luck, she decides to visit the creepy out-of-place castle and see if she can’t sell something to its residents. Once there, she finds Edward, a young man with scissors for hands, living alone in the attic, and resolves to take him home. Edward, being unusual, becomes an object of interest for Peg’s gossiping neighbours, and becomes quite popular once his talent with using his hands (to sculpt shrubs or cut hair, among other things) becomes known. Unfortunately, complications arise. The rest, I’ll leave unsaid. If there was ever any doubt this is a Tim Burton film, here it ends. The movie has an odd feel to it. 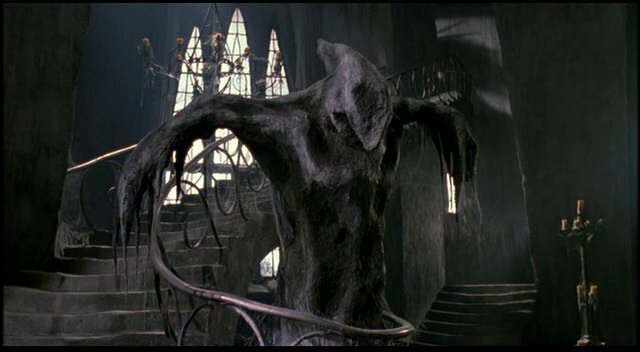 Edward’s castle home is very dark and dreary inside, and the outdoor scenes are very vivid by contrast. 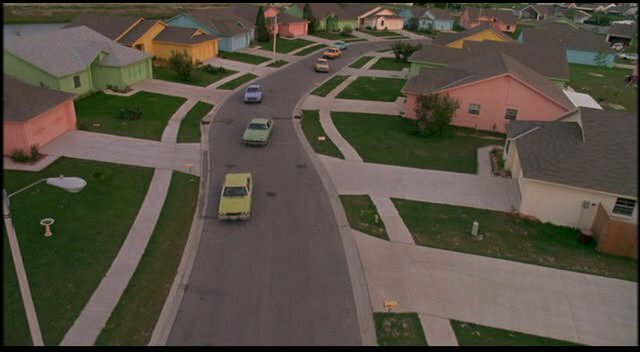 The homes in the town are all horrible pastel colors. The town feels like some weird parody of fifties suburbia, though the film takes place in more modern times–probably the present day (i.e. about 1990). What a horrible, soul-sucking place this town is. The movie is quite slow. I don’t require that movies be all action-packed thrillers, of course, but I sometimes got a little impatient to see some character development. And, really, not much character development happened–most of the characters end the movie just as the began it. Edward becomes a little more comfortable around people as the movie progresses, and Kim comes to like him more, but that’s about it. The lack of development isn’t entirely a flaw–I’d say it’s a large part of the point of the movie. Edward begins the movie alone and ends the same way, as a result of the other characters’ flaws. The message seems to be that people are horrible, cruel beings that cannot help but destroy any innocent and pure thing they find. Edward was too ‘gentle’ (as the film’s tagline proclaims him) for those flawed people to accept. Johnny Depp’s performance as Edward is actually quite good, and there are some really excellent moments, both of comedy and of pathos, evoked excellently by Depp’s mostly-silent portrayal of Edward. Peg’s husband, Bill, played by Alan Arkin, is also great–he takes all the events of the movie in stride and it’s great fun to watch. As I said earlier, the movie’s slow pace and lack of character development aren’t entirely flaws. The main problem with the movie, I think, is the ending. I can’t help but feel like the ending is just lazy. It’s very unsatisfying. I don’t need a happy ending, but really it feels like the movie just goes on for a while and then stops. It feels unresolved, but not in a way that really contributes to the themes of the film. It’s a shame.